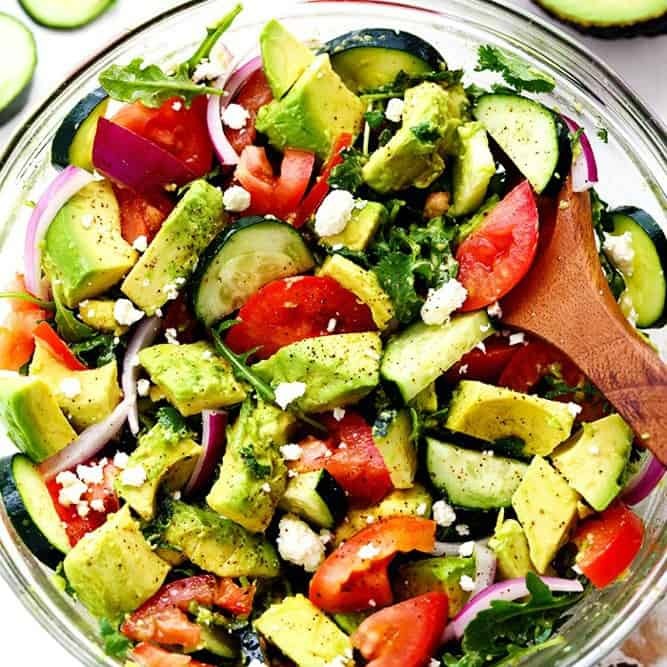 Avocado, Tomato and Cucumber Arugula Salad is fresh, delicious and light and packed with amazing flavor! Tossed in a tangy lemon glaze and topped with feta cheese, you won’t be able to get enough! I am happy to report that I survived the move this weekend. Whoa. Moving is the most exhausting thing in the world. And as the years go by you just keep collecting stuff. And then your kids collect stuff. And your house is borderline hoarders because you get so attached to the weirdest things. I finally got to the point where I just had to get rid of it! Even after the movers come you are left with all of this little stuff and nick nacks that you just don’t know what to do with. So many trips are made after the move just to take all of the stuff you didn’t know what to do with before to the new house. But we are so excited to be in our new house! It is so amazing to finally be in a place to call our own. It is so hot right now. And moving in it is so much worse! I don’t even have much of an appetite in the summer because it is so bad and all I crave are salads, popsicles, and no bake treats. LOVED this quick and easy salad. I could have eaten the whole entire thing by myself. 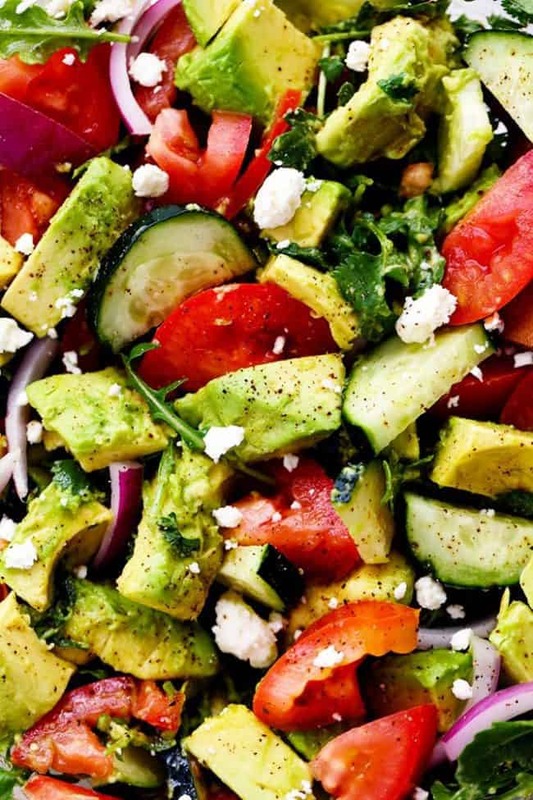 I love fresh avocados but when you mix it in a salad with fresh tomatoes and cucumbers it is incredible. I loved the addition of the feta cheese. I always sprinkle everything with a little feta because it is so good. This salad is so simple but packed with so much flavor. It makes a light and healthy dinner that you guys are going to love! 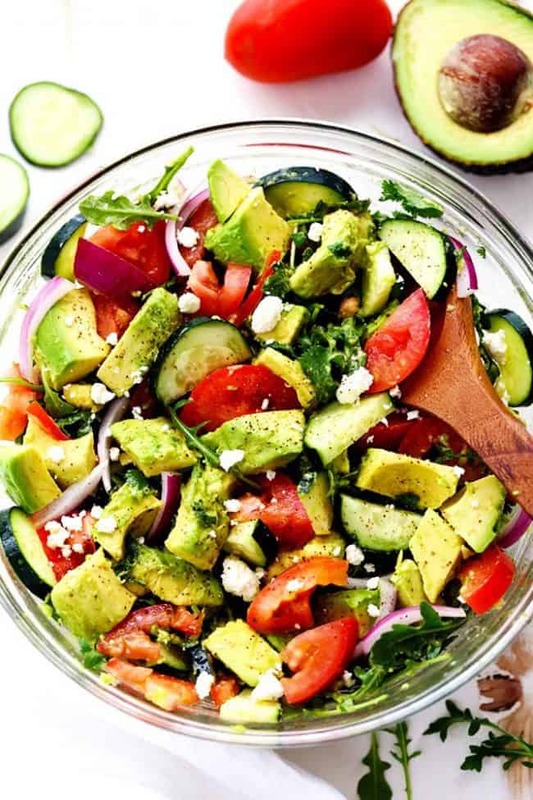 Avocado, Tomato and Cucumber Arugula Salad is fresh, delicious and light and packed with amazing flavor! Tossed in a tangy lemon glaze and topped with feta cheese, you won't be able to get enough! hey girl this looks so good! And yes moving is just crazy, my husband and I moved into our house that we bought 2 years ago and of course it was worth it! Anyone know the nutritional value for this dish? Calories, carbs, fats and proteins? Thank you! This is absolutely fabulous. Someone shared it on Facebook last week and I could not stop thinking about it! I stopped to buy the ingredients mid-week and just made it. This will be in my life forever. Thank you! This looks amazing!! Im not a fan of arugula so I will use butter lettuce and I think fresh mozzerella cut into the cubes the same size. yummmy! 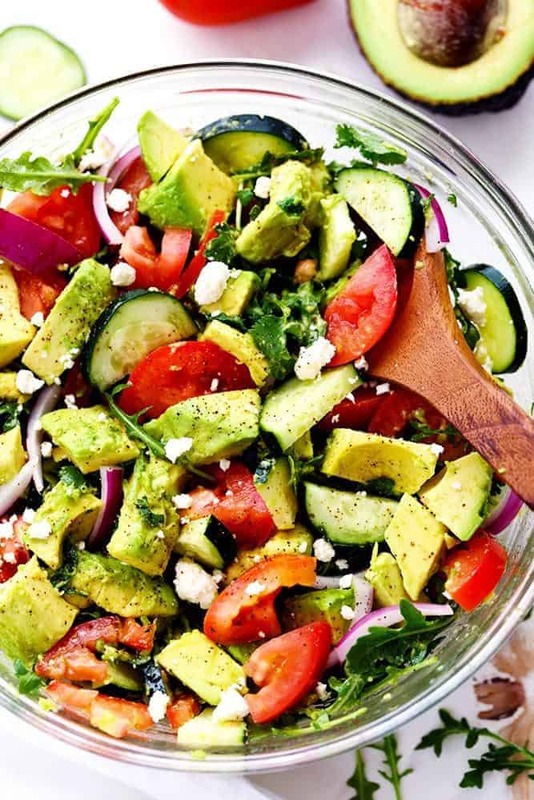 This salad is right up my alley! What are those tiny specks in the salad. Too small for pepper…is it sumac? Hi Alyssa, if you try to keep the salad for 2 or 3 days WITHOUT the dressing, what keeps the avocado from turning brown? Really good! Great for summer! This is the best salad and it is also great as a topping for tacos and tostadas. Love it. Where do we find the nutritional information for this recipes and others that you post? Is there a dressing for this? This looks amazing….especially with the addition of arugula! I am headed to the beach for a girl’s trip so this is on my list to prepare for the girls! Thank you for the recipe! This looks amazing….especially with the addition of arugula! I am headed to the beach with girlfriends and plan to surprise the girls with this salad! Love this! Light, refreshing and healthy! I discovered I was out of feta so had to use something else but agree feta would be perfect on it. I guess because I use it so often I ran out and didn’t realize I didn’t have a new container of it! Thanks for sharing! Looking forward for more! Yummy, my favorite fruit with veggies ? Please post the nutritional value (CARBS) in all of your recipes!!! Thanks for the comment. I use myfitnesspal.com and skinnytaste.com for all nutritional facts. Thanks for following along! I’ve made this before but not for years and this inspired me to take a walk down memory lane, ours a delicious salad! !